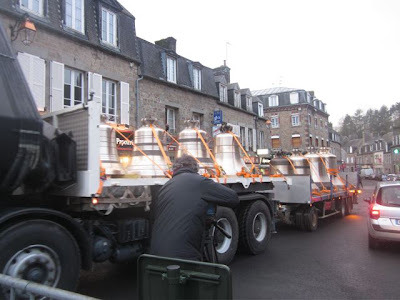 As I write this, if all has gone as planned, the convoy transporting the new bells for Notre Dame Cathedral's 850th birthday celebration of history, art and spirituality, will have arrived at Porte Maillot in Paris. 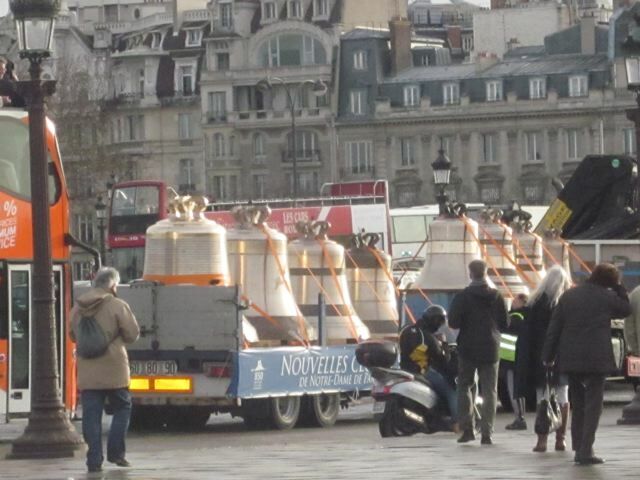 From there to be escorted by the Prefecture and police de Paris down the Avenue de la Grande Armee, Place de L'Etoile, Champs Elysees, Place de la Concorde, quai des Tuileries, quai Francois Mitterand, quai de Gesvres, Pont d'Arcole traveling at 10 km/h. The bells will arrive in front of the Cathedral at approximately 4:30. Les camions (the trucks) carrying the nine bells, left this morning from the Cornille-Havard foundry in Normandy where eight of them: Gabriel, Denis, Anne-Genevieve, Marcel, Etienne, Benoit-Joseph, Maurice and Jean Marie were constructed. 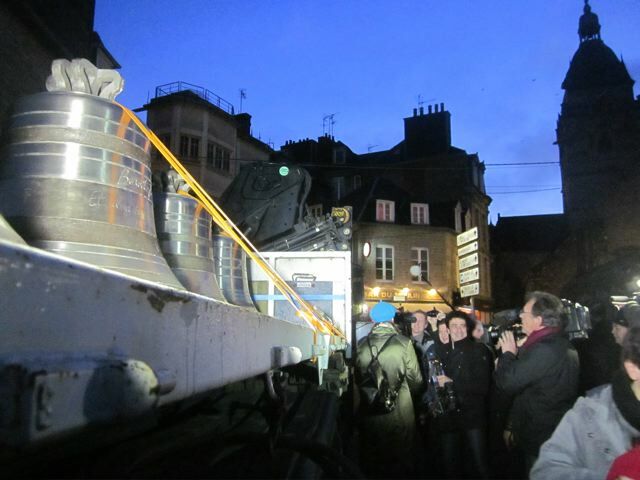 The bourdon bell named Marie (in the 1st truck) was made at the Eijsbouts Foundry in the Netherlands. The combined weight of the two trucks is 95,982 tonnes. There were many discussions regarding which bridges to cross! Eric Thiermann "The Media Impact Group"
And following those trucks as part of the convoy will be Eric Thiermann & Aleksandra Wolska, friends from Santa Cruz California who arrived with their cameras to crash with us on Tuesday night, the 11th hour! We have been working feverishly for 6 weeks to secure the authorizations & filming permissions so they could join the motorcade and film the unveiling of the new bells. They have made a documentary called "The Heart of a Bell" and were hoping for additional footage on the "birth of a bell". I've been writing e-mails, wheedling french friends to make phone calls, and breaking out in cold sweats with no definitive word arriving from the foundry. Then, Voila! on Wed. afternoon, the e-mail came in from "Emmanuelle Boisseau" the liaison at Notre Dome (and in french hunchback is "bossu"-coincidence??? ), granting access and a place in the convoy. It's actually easier than getting a "carte vitale"! I knew there was something special about Emmanuelle! Somehow I believed she would come through for us. 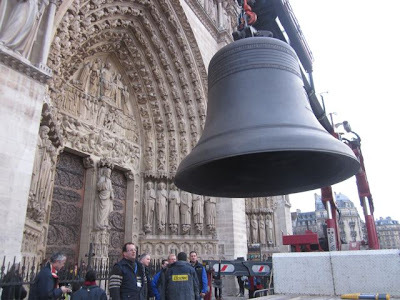 Then I read that only the bourdon bell and centre piece, Emmanuel, which was cast in 1686 and weighs 13 tons, was spared and replaced in the South Tower in 1802 on the orders of Emperor Napoleon I. Widely considered the most remarkable in Europe, it rang for the coronation of kings and to mark the end of the two world wars – It's thought its unique sound comes from the gold and silver jewellery donated by wealthy parishioners of the time which were added to the molten metal. 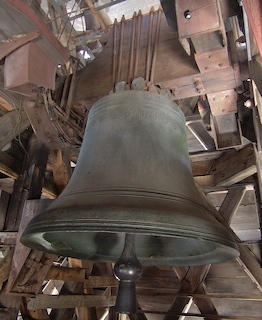 Notre-Dame cathedral had 20 bells before the French Revolution (1789): 8 bells in the North Tower, 2 bourdon bells (Marie and Emmanuel) in the South Tower, 7 bells in the spire, and 3 bells in the north transept. The bells were all dismantled and melted in 1791-1792. On February 2nd, the bells will be consecrated by Cardinal Vingt-Trois, the Archbishop of Paris. 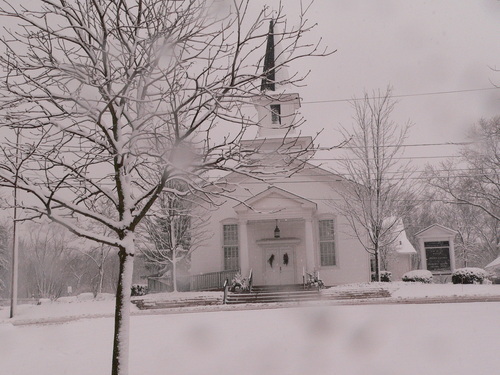 The blessing of a bell is not traditionally like other blessings and is referred to as a "baptism". Thus they are given names, like people. They speak with a voice. I've been interested in bells ever since reading "The Hunchback of Notre Dame" and seeing the 1939 film version, which is not particularly true to Hugo's novel, but made me sob nonetheless. I would sneak up into the bell tower of our little Long Grove country church which was just down the road, next to my Grandma Ruth's house. This is where I first discovered "bats in the belfry" on dusky summer nights. It was spooky in there with the beady eyed bats darting in and out of the bell tower, delicately prancing with their sinfully soundless sonar. I was sure they were all related to Dracula and shape-shifting behind my back. To his hundreds of friends and acquaintances in Newark, these purile [sic] and senseless attacks on Hon. John W. Cassingham are akin to the vaporings of the fellow with a large flock of bats in his belfry." "He was especially charmed with the phrase 'bats in the belfry', and would indubitably substitute it for 'possessed of a devil', the Scriptural diagnosis of insanity." Indubitably, I fancied I might go insane myself or deaf from the bell ringing like Quasimodo. Wonderful creatures really--those bats--mammals that can fly. It gives them a liminal being status in some cultures like Tonga where they are sacred and considered the manifestation of a separable soul. For the Cherokees and Apaches, the bat is a trickster spirit, but they are lucky in Poland and for the Chinese, a symbol of longevity and happiness. These Greek capitals, black with age, and quite deeply graven in the stone, with I know not what signs peculiar to Gothic calligraphy imprinted upon their forms and upon their attitudes, as though with the purpose of revealing that it had been a hand of the Middle Ages which had inscribed them there, and especially the fatal and melancholy meaning contained in them, struck the author deeply. He questioned himself; he sought to divine who could have been that soul in torment which had not been willing to quit this world without leaving this stigma of crime or unhappiness upon the brow of the ancient church. Afterwards, the wall was whitewashed or scraped down, I know not which, and the inscription disappeared. For it is thus that people have been in the habit of proceeding with the marvelous churches of the Middle Ages for the last two hundred years. Mutilations come to them from every quarter, from within as well as from without. The priest whitewashes them, the archdeacon scrapes them down; then the populace arrives and demolishes them. Thus, with the exception of the fragile memory which the author of this book here consecrates to it, there remains to-day nothing whatever of the mysterious word engraved within the gloomy tower of Notre-Dame,--nothing of the destiny which it so sadly summed up. The man who wrote that word upon the wall disappeared from the midst of the generations of man many centuries ago; the word, in its turn, has been effaced from the wall of the church; the church will, perhaps, itself soon disappear from the face of the earth. It is upon this word that this book is founded." ~extracted from the preface of The Hunchback of the Notre-Dame by Victor Hugo. In Chapter IV, it is revealed that the word means "FATE". William Blake - Hecate or "The Three Fates"
The clock struck midnight and I just received these photos from Aleks and Eric: BRAVO! Ahhh, lovely piece - just wish you could have inserted a sound track... of the bells.